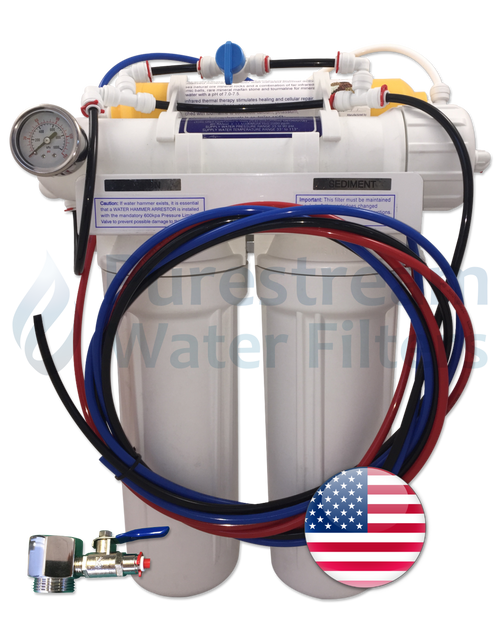 What are Reverse Osmosis Water Filters? 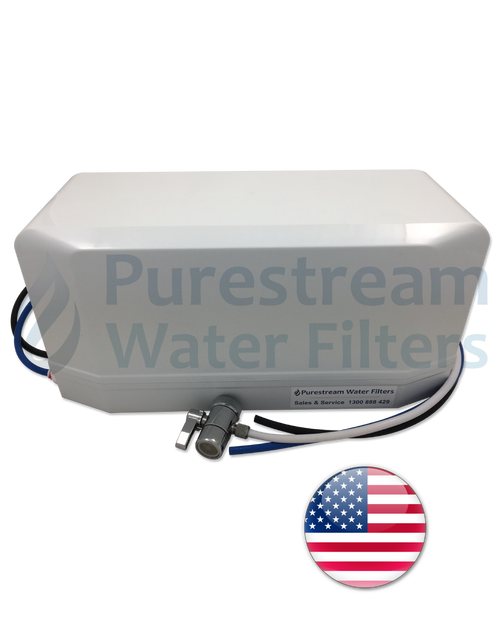 Reverse Osmosis Water Filters come in both portable and undersink models. A laundry model, when space is limited on the kitchen bench, as well as countertop and space saver models. As the production of pure water requires water to be forced though an ultra fine membrane, this can be a slow process and in the case of portable models, water should be stored in a container for daily use. All undersink models are plumbed into the water supply, have their own storage tank and production of water is automatic, as water is consumed. 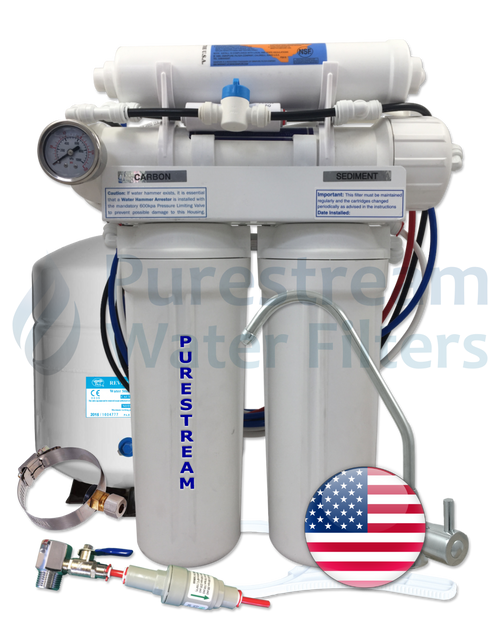 Included in all Purestream Reverse Osmosis systems, the membrane flushing service mode ensures the purity of the membrane is maintained by eliminating any crysalisation of contaminants. Simply turn the blue handle once or twice per year to ensure purity of your water. Pure water is produced at approximately 1 litre every 5-6 minutes. There is also a waste component, with 1 litre of pure water to 1-1/2 litres of waste water. Some companies offer a faster production with lower waste, however in our testing results, we have found too many minerals are left in the water. We would normaly expect reverse osmosis water to contain approx. 6-8 ppm of minerals, however with models being promoted with faster water production and lower waste ratios, this has increased to 20+ ppm of minerals left in the water. This accesses the cold water by utilising a 3/4" adaptor and stop valve which is connected to the cold water tap, in between the tap and your washing machine hose. It can be attached to the wall by means of the stainless steel bracket or sit on a shelf. Your portable revcerse osmosis has two tubes exiting the unit, One is waste (black), which can be directed down the drain, or collected for use on the garden or used for washing. The blue tube contains your pure water and should be stored in containers, either glass or plastic bottles Water is then accessed from these storage containers. It is not feasible to turn the unit on when a glass of water is required. Production of pure water is approx. 1 litre every 5-6 minutes. Ideal for people who rent and do not want a permanent installation. Sits on the kitchen bench and attaches to the water supply by means of the aerator thread on your kitchen faucet. Your countertop reverse osmosis has two tubes exiting the unit, One is waste (black), which can be directed down the drain, or collected for use on the garden or used for washing. The blue tube contains your pure water and should be stored in containers, either glass or plastic bottles Water is then accessed from these storage containers. It is not feasible to turn the unit on when a glass of water is required. Production of pure water is approx. 1 litre every 5-6 minutes. Reverse Osmosis Space Saver. A compact 3 stage unit, 2 kgs. in weight and connects via the aerator thread on your kitchen faucet. Comes with joiner so can be easily disconnected and stored in a cupboard when not in use. This is the most convenient unit as it has its own storage tank and water is automatically produced as water is used. Installed into the water supply, water is accessed via a separate faucet on top of the bench. Water production is the same as with the portable, however the 8, l2 or 18 litre storage tank maintains sufficient supply for every day needs. 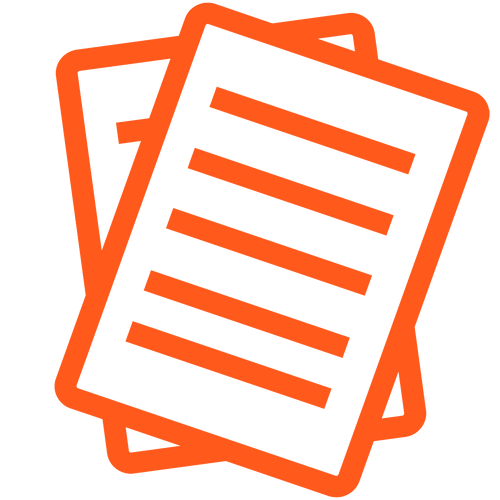 More information is available on the reverse osmosis process. Reverse Osmosis is the most effective means of water purification and will effectively remove: Up to 99% of Aluminium, Asbestos, Fluoride, Iron, Lead, Zinc, Mercury, Calcium, Sodium etc. Micro-organisms including Giardia, Cryptosporidium, Meningitis, Hepatitis, Viruses and Bacteria. Toxic metals and radioactive elements. Pesticides and Herbicides including DDT. Stage 4: Polishing carbon to ensure an excellent final taste. As Reverse Osmosis is a slow process, producing approx. 8-10 litres an hour, undersink models include the option of an 8, 12 or 18 litre stainless steel storage tank that automatically makes water as you use it. With portable models, it is necessary to store the water in a container and use the water from the container. Running a portable unit for 30 minutes will usually deliver 4-5 litres. Our storage tanks are pressurised to 7-8 psi at assembly and constructed of stainless steel anywhere water comes in contact with the unit. An optional 8, 12 or 18 litre tank is available. No electricity is required.